We want to rush back to Castle Town. 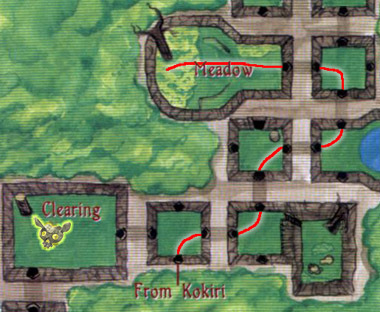 If you’ve been following the walkthrough thus far, you’ve already gotten the two Pieces of Heart found in Zora’s River. If you didn’t, you can now use the new found Boomerang to snag them very easily. 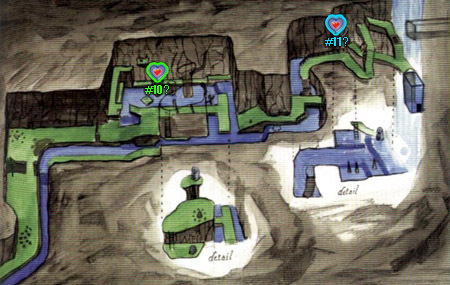 One Piece of a Heart is on a little ledge near the waterfall that leads to Zora’s Domain. Just stand on one of the nearby platforms and use the Boomerang to retrieve it. The other Piece of a Heart is about halfway through this area, on top of a skinny platform in the middle of the water. Use the nearby platform that ramps up to that point to snag it with your Boomerang as well. If you’ve already done all that and are just trying to get back to Hyrule Field, you can swim along the river (mash the B button to go faster) to get lots of free Rupees and make it in record time. Now that we have the three Spiritual Stones, head back towards Hyrule Castle to see Princess Zelda! As you get closer to the castle though, you’ll see that the drawbridge is up, even during the day, and dark clouds begin to loom overhead. After a short bit, a movie begins and… It’s the dream from the beginning of the game…! The drawbridge lowers and Impa rides out on a white horse, carrying Zelda by her side. The girl tosses the Ocarina of Time at you, which lands in the moat. Turn around Link! Ganondorf, the King of the Gerudo Thieves plays twenty questions, then zaps Link with some glowy purple and gold stuff when he doesn’t do good at that game. JERK! He rides off laughing maniacally. Well that’s lame… Turns out, he and his Gerudos attacked Hyrule Castle and killed the king. He’s hunting down Zelda so that he can use her to enter the Sacred Realm and claim the Triforce. When the movie ends, jump into the moat and dive down to get the Ocarina of Time. Ha, you forgot about it didn’t you?! It may take a couple of tries, the water is moving after all… Once you surface with it, (TA-DA!) you’ll get a vision of Princess Zelda teaching you the Song of Time. Oooo, misty! Shiny! You’ll appear next to the drawbridge (It’s magic! You were in the water a second ago…) with Navi scolding you to go to the Temple of Time. This side quest is entirely optional! You can also find it in the Masks section. You can start doing this side quest as soon as you pass off the letter from Princess Zelda to the guard at the base of Death Mountain. This quest leads to the Mask of Truth, which allows you to talk to the Gossip Stones all over Hyrule. It’s entirely optional, but if you do choose to do it, all you have to do is go to the Happy Mask Shop in the Market, borrow a mask, and find a suitable owner. The first mask you’re eligible to borrow is the Keaton Mask (10 Rupees), which is a pretty easy one. The guard at the base of Death Mountain in Kakariko Village spoke of it at length and how he wanted it for his child. Slap it on and talk to him, he’ll give you 15 Rupees for the darn thing. For starters, go to the Lost Woods. Now, before we go find the owner of this mask, there’s a little side quest we can do. Go right, left, right, left, left to find the head meadow. Go to the back of this area and walk around where the butterflies are at to find a secret hole. Inside, put on the Skull Mask and step forward. This will make a bunch of Deku appear who appraise you then follow you around excitedly for a bit. After a moment, they’ll go get their leader and he’ll gift you with the second Deku Stick upgrade. Nice! The person we want to actually sell the mask to is one of the Skull Kids, located right near the entrance of the Lost Woods. Once you enter, turn left and step on the tree stump. Put the Skull Mask on and speak with the Skull Kid. He will pay you 10 rupees for the mask. You sold it at a loss, so you will lose 10 rupees on this deal. Oh well. The third mask looks just like a ReDead (which you’ll see soon enough, 30 Rupees). It’s also a fairly easy one to do. Head to the Kakariko Graveyard during the day to find a small kid stomping around with a stick. His life dream is to be like Dampe, the grave keeper and be scary. Somebody needs a hobby… Anyway, flash him the Spooky Mask and he’ll cough up all 30 Rupees without blinking. Sheesh! This last mask isn’t as obvious… The Bunny Hood (50 Rupees) is simple, but will require you to run around. 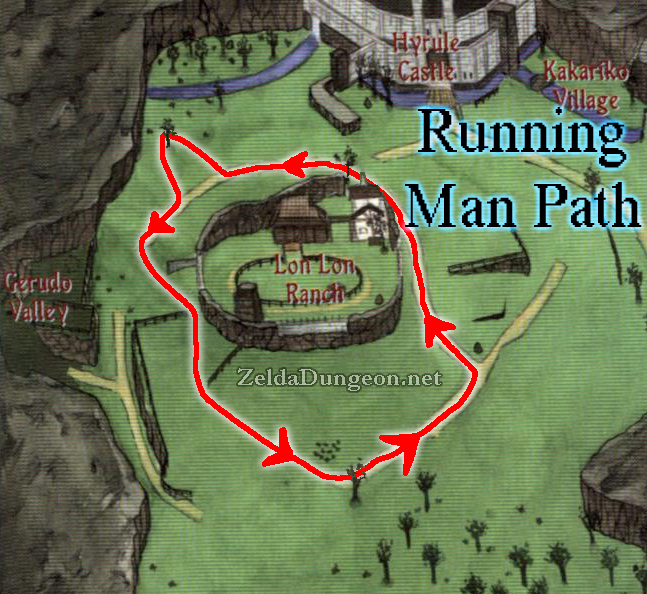 In Hyrule Field, there’s a guy known as the Running Man who is constantly jogging. He starts out in the northeast corner and works his way around the field counter-clockwise, sticking close to the road surrounding Lon Lon Ranch. 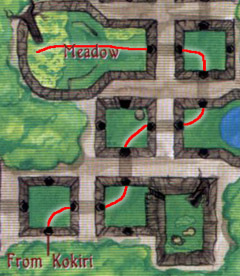 The easiest way to find him is to enter Hyrule Field from the Market and follow the road leading right. By the time you walk past Lon Lon Ranch, you’ll see him. Return to the Happy Mask Shop and pay up the 50 Rupees that the Bunny Hood was actually worth. The Happy Mask Salesman will then allow you to borrow four new masks. Three of them are just for looks, but the one of interest is the Mask of Truth, which allows you to hear the thoughts of animals, people, and lastly, the Gossip Stones (giggling, time telling stones scattered throughout Hyrule). If you’d like to see all of the Gossip Stone “wisdom,” visit our Gossip Stone section which has them all listed. Borrow the Mask of Truth for now, and real quick before we continue our journey, we have one last thing to snag. Go back to the Lost Woods and go to the secret meadow, to the Forest Stage. At the start of the Lost Woods it’s: right, left, right, left left. Then fall down into the hole that’s hiding by some butterflies in the back of the area. With the three Spiritual Stones and the Ocarina of Time in hand, we can finally head to the Temple of Time. Go to the Hyrule Town Market go through the stairs between the Happy Mask Shop and the Potion Shop. Once in the gardens, you can talk with the Gossip Stones with your new Mask of Truth to learn some useless information… Moving right along… Round the corner and enter the giant temple. Head on in and place the spiritual stones on the pillar in front of the Door of Time. Once the door opens, head into the inner chambers of the Temple of Time. Inside you’ll find none other than the Master Sword! This mystical blade has been Link’s trusty companion in many of the other titles, but it’s a little surprising to find it in here. Go ahead and climb up onto the pedestal to claim the evil destroying sword. You’ll witness another scene in which the entire pedestal begins glowing and shimmering with blue light. Sweet! So it turns out, rather than opening the Door of Time to stifle Ganondorf’s plans, you were within his plans all along. He used you to get to the Sacred Realm. Shortly after a laughing session from your nemesis, you’ll see Link waking up in a fancy blue temple that looks like flowing water. Ganondorf managed to get the Triforce and turn Hyrule into a land of monsters. Stupid head! The only way to overthrow him is to gather the powers of the six sages, one of them standing in front of you right now. After giving you the Light Medallion, he’ll send you back to the Temple of Time to save the other sages. You’ll appear back in the Temple of Time, and everything’s quiet and dark… Link will start walking away and be surprised to find he’s not alone. Sheik, a character who will be a guide of sorts (to replace the obnoxious owl…) introduces herself. She tells you a little more about the Sages and informs you that she’s fond of poetic legends. After a quick chat, she tells you to go to Kakariko Village before tackling the Forest Temple.